Bear with me here, people, because I'm going to talk baseball for a second. Which is really not my strong suit. But it's just a metaphor. What's more interesting in baseball? When the batter makes a base hit, runs to first, but gets tagged out before they get on base? Or when the batter steps up to the plate, points to the bleachers, and then swings as hard as humanly possible--- an strikes out? Both have the same end result: the batter is out. But the latter, at least, has ambition. I'm all for ambitious failures. There are several that come to mind. Aaron Sorkin's Studio 60 on the Sunset Strip was certainly not lacking in ambition, as both its text and subtext was, "We are going to deliver extraordinary television that will raise the bar", which it utterly failed to do. Now, that said, I enjoyed the show, even though the show-within-the-show completely failed to be the highly charged, cutting edge political satire that the show held itself up to being. But you could consistently see a program trying to reach further than its grasp. Another that sticks with me is last year's Sucker Punch. I could probably write pages and pages about Sucker Punch, in terms of attempted messages of empowerment and feminism, and where it may or may not have succeeded and failed, and how it attempted far too much with its everything-and-the-kitchen-sink action sequences. But one thing you can't say about Sucker Punch is that it didn't try to accomplish something big and bold. In trying, it crashed, but on some level I think that crash was spectacular. And you have to admire that kind of failure, at least over the failure of milquetoast sameness. John Scalzi once gave me some great advice (and a roomful of Workshop attendees, so I'm not claiming it was a personal moment of exchanging wisdom) to "embrace the power of sucking". That writers should constantly push themselves out of their comfort zone, and accept that what they are going to do could very well fail... and that's okay. And as someone who has faceplanted more times than he could easily count, I totally agree: you learn a lot more from your failures. *- Or, at least Aaron Sorkin credits it to A Lion in Winter in all the TV shows where he uses that quote. Anton Chekhov's famous quote, in turns out, wasn't quite what I thought it was. I had thought it was, "If a gun is hanging on the wall in Act I, it must be fired in Act III. If it is fired in Act III, it must be seen on the wall in Act I." The essence is still the same, but Chekov's actual quote emphasizes not setting up foreshadowing that isn't paid off. But the thing with long term plans (or long term made-up-as-you-go) is "Act III", as it were, could be a long way down the road. The writer might know how it's going to pay off, but the when is in the foggy horizon. And that's OK.
With a BIG long-term project, though, you're going to need a lot of guns. You might not hang them all up on the wall at once, but you know you're going to need them. This is relevant right now, for me, as I've recently figured out the details of several guns I intend to be shooting much further down the road. On top of that, I've been asked to fill some more wall space in my current drafts of things. These two things, combined, present an excellent opportunity. So I'm off to stock up the armory. Last night PBS aired the BBC Sherlock episode "The Reichenbach Fall", which is a modernized variant of the original Doyle short story "The Final Problem". The Robert Downey Jr. Sherlock Movie "A Game of Shadows" used the same story as the core of its inspiration as well. The story is, of course, the classic confrontation between Holmes and his diabolical opposite, the criminal mastermind Prof. James Moriarty, culminating in a fight between the two of them at the top of Reichenbach Falls, where they both plummet to their supposed death. While I've read several Holmes stories, I only got around to reading "The Final Problem" this past week. And maybe it's a result of highly raised expectations, but I found the actual original story rather wanting. Here is the problem, in my mind-- and admittedly, part of this might be a factor of the literary styles of the time-- but this story is all telling, and no showing. Now, to some degree, that is the case with all Holmes stories, as they are first-person narratives from Watson's perspective. Watson tells the reader much of what happened, but he's telling of his own experience. In the case of "The Final Problem", Watson's own experience is largely absent. Much of what happens in "Problem" is Holmes telling us that Moriarty exists, and that he's brilliant, and Holmes totally has a plan to entrap Moriarty. Then said plan didn't work, as Moriarty slipped the noose. The hows and whats of the plan or Moriarty's near-capture are never told. Then, while Watson is called away to help a woman having a heart attack-- which turns out to be a ruse to pull Watson away-- Holmes and Moriarty have an unseen fight in which both are presumed dead. * I'll have to double check, but Watson might never see Moriarty himself-- he only has Holmes's word that the man exists at all. What really struck me, reading this story, was what it wasn't. Namely, there's nothing in the story of Doyle setting up an epic, final confrontation between two great minds. This isn't a build up to a grand, well-earned finale. If anything, I read the thrown-together half-effort of a tired writer who was done with a character and wanted him gone. It essentially goes, "Here's an archnemesis worthy of Holmes... and rocks fall, everyone dies." I've rambled for a bit here, but there is a key question: how does one maintain the passion for a character, for a world, over a long period of time? How does a writer keep it fresh? I can think of several writers that I felt, at least, that they were churning out long-running series more on momentum and demand rather than still having a story that they were burning to tell. Maybe that's why I'm big on the long-term planning. It's easier to maintain that passion, that energy, if there still is story planned. Once you get past the stories you want to tell... then I'm not sure where it can come from. The deadline for submissions for the ArmadilloCon Writers' Workshop is a month away. High time to plug it again. The ArmadilloCon Writers' Workshop has become a major event for aspiring SF/F writers. It meets on Friday morning before the convention and runs for seven hours when the convention starts. Workshop curriculum is designed for beginning and intermediate students. Workshop participants are given the opportunity to have their work critiqued by major pro editors and/or writers. The workshop will cover craft, markets, the dos and don'ts of preparing your work for professional publication, and more. Discussions range from the basics of grammar and style to plot, theme, character, and setting. Within the breakout session, students receive an in-depth critique of their work from both instructors and peers. This roundtable style critique session is invaluable for learning what works, what doesn't, and how to edit your work. Elizabeth Bear, Julie Kenner, Scott Lynch, Robert Bennett, Liz Gorinsky, Mark Finn, Martin Thomas Wagner, Martha Wells, Matthew Bey, Nicole Duson, Scott Johnson, Jessica Reisman, Cat Rambo, Joe McKinney, Marshall Ryan Maresca*, Anne Bishop, Stina Leicht, Jeremy Lassen, and Amanda Downum. Check the website for specifics on registering. I'm really looking forward to this year's workshop and con. If you are a writer looking towards publication-- especially in the Central Texas area-- I cannot stress enough its value. It's really an amazing experience, and compared to most other workshop/conference opportunities, it is a downright bargain. *- Yeah, we totally could play the "One of these things is not like the others" game with this group, hmm? I had been thinking about movies and the studio-system's somewhat slavish devotion to "three act structure", which more and more I'm seeing as a big problem in modern cinema, and too often I'm seeing that same advice being given to novelists. And that's a shame, because three-act structure is bad advice for movies, and it's downright horrible for novels. This is the problem in using tools of deconstruction and analysis and trying to use them for construction and creation. They aren't meant to be used that way. Now, admittedly, I did use deconstruction and analysis to create the Twelve-Part Structure, but I did it as a means of making a tool of construction and creation. Some spoilers from here on out. Establishment: Loki shows up out of the Cosmic Cube, enthralls Hawkeye and Dr. Solveig, SHIELD fails to stop him. With this, we establish the world and the stakes-- namely, this is a world where stuff like this happens. Incitement: Gather the Team sequences: Fury talks to Cap, Natasha shows her skills and recruits Banner, Coulson talks to Tony. Challenge: Loki begins his "distraction" plan in Germany, where Hawkeye does the real plan. Cap fights Loki, and then Tony shows up and subdues him. Altercation: Thor shows up to take Loki, and then Tony and Thor and Cap all fight each other over essentially jurisdiction issues. Payback: Loki is locked up, but all the Team squabbles with each other over petty tings. In other words, Loki's subtle discord is sewn. Regrouping: Natasha gets info out of Loki, the Team gets a better sense over what's actually happening. Collapse: Intergroup squabbling reaches a fevered pitch, as they discover SHIELD's plans for the Cosmic Cube. Hawkeye attacks the Helicarrier. Retreat: Hulk smash, Tony and Cap work on keeping the Helicarrier in the air, Loki escapes and kills Coulson. Recovery: Tony and Cap fix the Helicarrier, Natasha smacks Hawkeye's head back together, Bruce wakes up with Harry Dean Stanton. Investment: Coulson's bloody Captain America cards, Tony gives his Big Speech to Loki, and the portal of Alien Destruction opens up. Resolution: Hulk smashes the puny God. Tony throws a nuke at the aliens. Natasha closes the portal. Loki is captured, Thor brings him home. Fury gives a speech. Shawarma. Yeah, you could break that into "three acts", but you'd be being pretty reductive about what actually happens. Whedon was essentially given "three acts" by the studio people (namely, "Heroes come together, then they fight each other and split apart, and then they come together for Big Damn Fight"). With a lesser script that could have ended up as more wheelspinning non-action-- or worse, some kind of Plot Coupon collection in lieu of an actual story in the middle. *** Instead, with a more complicated structure, you get a FAR more engaging work. *- Another superhero movie example: Green Lantern. That's just full of wheel-spinning until the third-act turn where Hal Jordan, the supposedly fearless guy with near-limitless power, finally decides that maybe he should try and do something. And by "do something" I mean tell a bunch of people he previously blew off that they should do something. **- I am NOT claiming that Whedon is aware of my Twelve-Part Structure, or that he necessarily used it or a similar framework. It's more that Twelve-Part Structure fits as a framework quite nicely. ***- I'm looking at you, Percy Jackson movie. "Kids, you tried your best, and failed miserably. The lesson to learn is: never try." In case I've not made this clear: I am a straight, white, upper-middle-class, non-religious*, able-bodied, able-minded**, average-height right-handed male. There literally isn't a privileged class that I don't fall into. I am the presumptive audience that Hollywood plays to, and I fit the characteristics presumed in the typical mass-market protagonist. If a movie trailer starts out with something like, "Jake was an average guy..." then you know what that means: someone pretty much like me. I try to approach this fact with awareness, especially when it comes to writing. Because whenever "Writing the Other" is talked about, it is usually talking about that which is not me. *** And whenever "Writing the Other" is talked about, it is crucial that I open my ears and listen. 1. In writing the Other, I will probably screw up. 2. I should try anyway. 3. In trying, mistakes will be made. Hopefully, these mistakes will be pointed out to me by those who have different**** life experiences than my own. 4. I should integrate what I learned from those mistakes and try again. 5. Repeat steps 3 and 4. Sadly, many writers in my position will not get past Step 3. A lot don't really get to Step 2. I was at a writing workshop where John Scalzi spoke, and he told us all to "embrace the power of sucking". In short, it's allowing yourself to screw up, because that's how you learn. The same applies here. I think the most important part in successfully writing The Other-- and with that successful writing in general-- is that act of trying, failing, getting up and trying again and again. It's important enough that it's worth the continued attempts. *- Catholic-raised agnostic, which fits in neatly to the privilege class in American society: presumption of a Christian background, with no social consequences that come from outward displays of faith. **- I sometimes say, self-deprecatingly, "I'm insane", usually in connection to writing or long-term plans. Despite grand plans of immense scope, I am sound of thought. This is a fine example of privilege showing: being able to joke about madness that doesn't exist. ***- Because those same sort of presumptions for protagonists apply to writers; most successful writers are, if not specifically identified as being otherwise, presumed to be straight, white, upper-middle-class, non-religious*, able-bodied, able-minded**, average-height right-handed males. Why do you think the best-selling female writer of our generation goes by J.K. instead of Joanne? ****- And relevant to the cases in question. This past weekend The Avengers went down in comic-book movie history. It broke box-office records, making over $200 million in just one weekend. More importantly, it was a success in terms of its goals-- bringing together the Big Damn Heroes of the Marvel Universe from their individual movies and teaming them up in a big, satisfying way. So it goes without saying that Avengers 2 is a lock. They even threw in the obvious Sequel Bait in the credits sequence. I'm just hoping they lock down the details relatively soon, because I'm already excited. Unfortunately, I can't see them getting it together earlier than Summer 2015. If I have one complaint about Avengers, it is that it comes too close to the Smurfette Principle: the team is Black Widow and five guys. This is not Joss Whedon's fault, I'm sure. Knowing his work, he probably did a lot of fast talking just to get Maria Hill in among the cast. But I know that the team of the movie was essentially handed down by studio edict. So, hopefully, Avengers 2 is going to rectify that. Though, reasonably, there are only so many New Avengers that can be added, and they aren't all going to be women. It seems like they really might get the Ant-Man movie off the ground, so he would be a likely add. 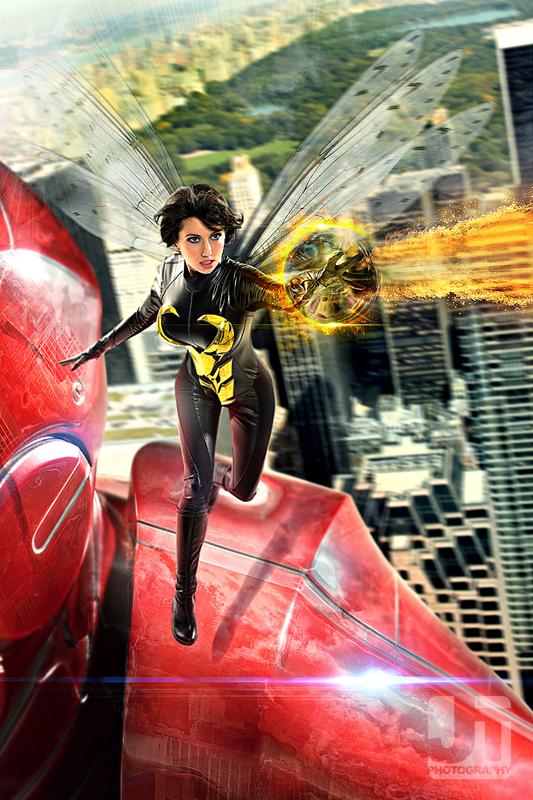 With him, it's pretty easy to add Wasp to the team (if she isn't a key part of the Ant-Man movie, which she totally should be). And it wouldn't hurt to maintain her original background, if for no other reason than to be a counterpoint to Black Widow: a socialite heiress with a solid head on her shoulders. She's not Paris Hilton; she's Ivana Trump. If, you know, Ivana had superpowers. My other key choice would be Ms. Marvel, aka Capt. Carol Danvers. Since it's looking like Avengers 2 will be going cosmic, her origin of being an Air Force pilot who is empowered when exposed to alien technology would fit in quite nicely. Plus Ms. Marvel ought to be (but isn't really) Marvel's equivalent of Wonder Woman: the universe's most notable female hero. Frankly, the Marvel Universe doesn't have someone would quite fits that bill. Black Widow isn't it. Nor is Invisible Woman, Elektra, Phoenix or Storm. Let's give Ms. Marvel a proper showcase. Those would be my choices. Many fans seem to be pushing for Scarlet Witch, though I respectfully disagree. I understand the reasoning: she was the second woman to join the team, she's a long part of Avengers history. But given her backstory is entangled with elements that the Marvel Movie-verse can't use (mutants and Magneto), and you'd HAVE to bring Quicksilver along with her... eh. It seems too much. Disclaimer: Amanda Downum is a friend and a critique partner. So this won't be an "objective" review. It's probably not even really a review. This is the third book in Amanda's Necromancer Chronicles (the first two being The Drowning City and The Bone Palace). Of the three, Bone Palace is probably my favorite. But Kingdoms is a close second. 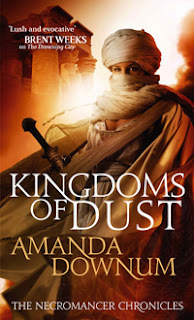 One of the things I really admire about the Necromancer Chronicles is how Amanda has pulled off displaying her worldbuilding without having it feel like a "travelogue" sort of series. Drowning takess place in Symir, which has a fantasy southeast Asia feel, Palace in Erisín, which is more western/northern Europe in flavor, and then Kingdoms is in Assar, which has a Middle Eastern bent. But one thing that is crucial is none it comes off as a cheap copy-and-paste of those Earth cultures... just familiar enough to give a sense of bearing. But more importantly, since the Necromancer Chronicles are so grounded in the character of Isyllt Iskaldur, the movements from place to place feel organic and natural. Isyllt is a spy, after all, and in Drowning she's away on a mission, in Palace she's back home, and in Kingdoms she's abroad again due to the fallout of events in Palace. And despite the chronological progression, each book stands nicely on its own as a singular adventure. Kingdoms more or less opens up with some "getting the band back together" of characters from Drowning-- there's only one secondary character from Palace that carries over-- while setting up the stakes for this book. I love how Isyllt is kind of self-loathing and messed-up, but without it just being telegraphed that she is self-loathing and messed-up, or having that be her defining characteristics. She's a straight-up hero in my book, but part of her heroism comes from her own self-loathing. She's the kind of hero that is presented with Bad Choice A and Bad Choice B, and through her own ingenuity comes up with Bad Choice C, which gives more solution than A or B, and most of the bad falls on her shoulders. My one complaint is the character of Moth, who carries over from Palace as Isyllt's new apprentice. For the first half of the book, she's there mostly as furniture, mentioned in passing as usually out doing her own thing. The second half has Moth suddenly becoming active, but mostly complaining that Isyllt doesn't pay any attention to her. For me, it came out of left field. Though Moth is the one key character who, unless I'm mistaken, we never get a point-of-view from. A better sense of her perspective in the first half would have given her complaints in the back half more weight. All in all, a fun, enjoyable read.